Sofa, so good. New developments in the ongoing saga of my living room, which I'm sure everyone around me finds exactly as absorbing a project as I do! Well, from eBay I obtained a flokati rug (which I refer to as my fuckari rug) with which I am very pleased, except that Graham likes to attack it as if it were a hostile cat. He also tracks bits of dead leaves across it because they get stuck in his fur when he explores the garden. Also, last weekend when I was hungover, I wandered into a furniture shop on Brunswick St and spotted possibly my ideal sofa! The Karlstad has a higher back, is only a three-seater and has those ugly legs. I could always get the aluminium legs and spray-paint them gold to match my coffee table, or perhaps even the same colour as the sofa. But the big difference is price: if I were to get the first sofa, it would cost me around $3000 in fabric and $5000 in leather. 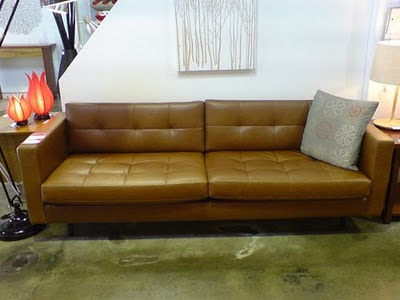 The Ikea sofa in leather (the fabric version isn't tufted) would cost $1900. I am anxious about buying a leather sofa since I own a cat; also, Tash said that leather would be hot and sticky to sit on in summer. 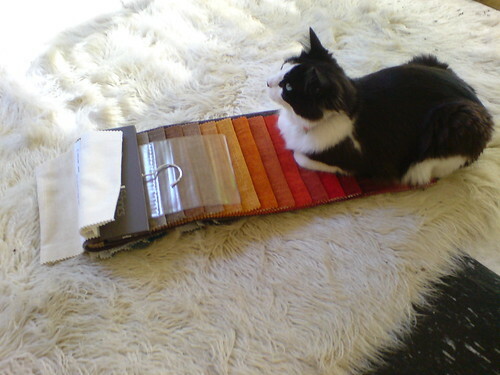 The furniture shop lady advocated a tight-woven fabric that it's hard for cats to get their claws into; that or a velvet or chenille so the cat only claws the top layer. I have always imagined my dream sofa in white or a pale cream colour; this is still my favourite as my living room isn't big and I think a pale-coloured sofa will make it look bigger, but it is not especially practical. Still, what are my other options? One of the fabric swatches is a red that matches my velvet chair, but would it be too overpowering and boudoir-esque to walk into a small living room to see this red sofa? I can't have a grey as this would clash with the brass coffee table, and I find the warmer neutral shades boring. In other living room developments, my indoor plants are slowly coming along, stymied only by my cheapness in buying little plants rather than large ones, and the stubborn refusal of the plants in question to grow as fast as I'd like. Perhaps I should invest in some larger pots. One of my plants is a ficus that seems to want to be a climber; I was at Cavallero last week and they have the same plant in the back courtyard as a wall-covering. Ideally I would like to train my ficus over a frame so it turns into a kind of indoor topiary. Ahhh, it feels so good to get my bourgie home decorating ideas down in pixels! This self-absorbed stuff is truly what blogging is for. I refuse to settle when I finally choose my new sofa, which ironically means I've been living with a sofa I hate for about 3 years. The complexity of the right choice is paralysing.